This Summer, pretty much everything that we are doing is outdoors. We are hanging out outdoors, cooking outdoors, and having our drinks and desserts outdoors too. I think it's the Latina part of me that likes to spend so much time outside. As a kid, it seems like all I ever heard my abuelita yell was for us to go afuera or outside. Now it's my turn, while the sun sets and the kids run around, I like to pour myself a glass of wine to unwind from the day. And before you know it the inevitable question arises, "Can we have dessert?" As much as I love that our heladero or ice cream man makes daily stops in our neighborhood, sometimes I'm in the mood for something different. My first piece of advice that I received when it came to drinking wine was that red wines go really well with chocolate and with s'mores being the unofficial Summer dessert, I thought S'mores on the grill would be a less messy way of getting your s'mores fix. It really is as simple as 1-2-3. Heat up the grill and place your cast iron skillet to heat on Medium/High heat. 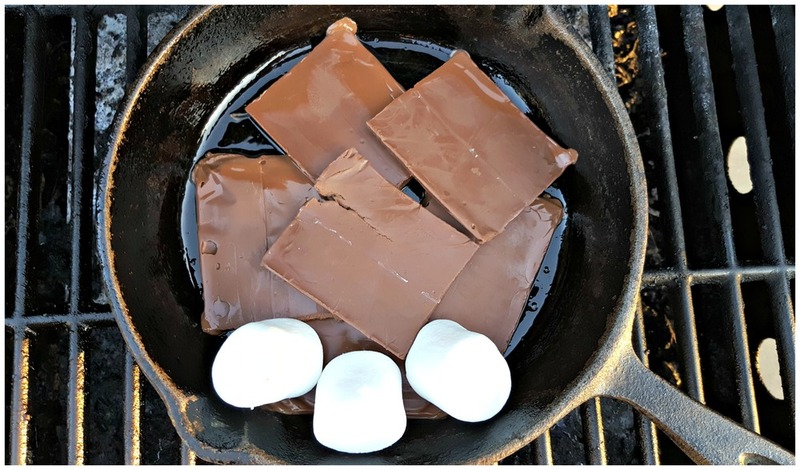 Add chocolate to the bottom of the pan and top with a layer of marshmallows. Watch as the chocolate melts and marshmallows heat and expand. That's it. 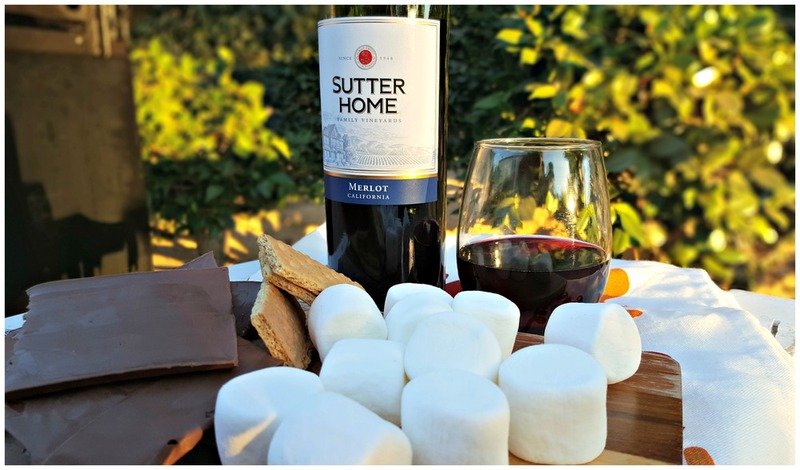 Take it off the grill, pour yourself a glass of Sutter Home Merlot and start dipping your graham crackers. Enjoy. Yum! Look at the ooey gooey mess of deliciousness. Don't be afraid to treat yourself to more than just a glass of wine, give it something sweet to go with it. Sutter Home is the definite go to wine for all of my summer entertaining needs. It helps to make the day-to-day a little more special and I can't deny that I especially like that Sutter Home is affordable. For everything you see here, I spent less than $15. You can find Sutter Home pretty much anywhere and always for a good price, so next time you are out shopping for Summer meals, pick up a bottle and pair it with something sweet. Check out these other great Sutter Home recipes and pairing ideas. Stay Cool with this Watermelon Vino Fresca! This shop has been compensated by Collective Bias, Inc. and its advertiser. All opinions are mine alone. #SummerVino #CollectiveBias The following content is intended for readers who are 21 or older. The temperature is heating up and Summer is starting to peek in on us and that means it's time to prepare to cool down. In this house like most Latino households, you can always count on us having two things on hand; sandia and vino (or watermelon and wine). Especially during the Summer, you can guarantee that at any given time there will be at least a half watermelon chopped up and ready for snacking in my refrigerator. How do you eat your watermelon? There are two ways that my family eats watermelon; 1. chopped up and topped with salt and lemon and 2. blended with ice and sugar. The blended drinks will always remind me of my grandpa. He always made the best drinks, with just the right amount of sugar. I have not always been a wine drinker, in fact for a while I didn't drink much at all outside of the occasional glass at a party. But lately I have really enjoyed the relaxation that goes along with a glass of wine. So with Summer quickly approaching I decided to combine my two favorite Summer time treats wine and watermelon and came up with Watermelon Vino Fresca. Kinda like an agua fresca, but with wine. What I liked most about this refreshing drink is that the flavors are not overwhelming. This is not a fruity drink, because Watermelon is not a super sweet fruit. And when I paired it with a sweet wine like Sutter Home Moscato, there was a good balance. I also liked the different elements, as you take a drink, you first taste the sugar on the rim, then the watermelon and last the wine comes through at the very end. My first step was to chop the watermelon. I find chopping watermelon to be really relaxing, maybe because I have a refreshing snack to look forward to, I don't know. But I could chop watermelons all day long! The next step is to take a piece of watermelon and rub it along the rim of the wine glass. Once the rim is wet, you can dip the glass into a plate of sugar. Note: Make sure to cut a few pieces of watermelon into tiny little slices like I did above, because garnishes make everything better. Next, add about 2 cups of ice to the blender and top with the chopped watermelon. Last, add the Sutter Home Moscato wine and blend. Pour into your sugar rimmed glass, top with your watermelon garnish and ENJOY! I remember my Mom buying Sutter Home Wine when I was young, it has a familiar tradition attached to it. And rightfully so, Sutter Home has been around for 65 years as an award winning California wine that's affordable and reliable, since you can find at almost any retailer. Sutter Home has such a variety, in fact, next month I will share another recipe that goes really well with another favorite Sutter Home wine, so stay tuned for that. In fact, if you are looking for more fun recipes and ideas for Sutter Home, check out UncorkTheMoments.com. Ah, there is nothing better to cool you off than a little sandia and vino on a warm Summer evening. I hope you enjoy my Watermelon Vino Fresca recipe. If you try it, I'd love to hear your thoughts by leaving me a comment below.